Type of book: Hardcover, 192 pg. Book size: 11.5"L x 9"W.
For enthusiasts reading magazines such as Motor Trend, Road & Track, and others, David Kimble is no stranger. His brilliant cutaway artwork has been gracing the pages of those publications for years. Whether he illustrated engines, transmissions, full-car chassis, sports cars, race cars, or classics, his cutaway artwork revealed, in excruciating detail, things that a camera lens could never capture. 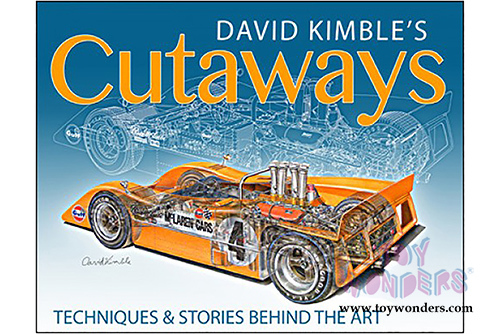 In David Kimble's Cutaways: The Techniques and the Stories Behind the Art, Kimble reveals the secrets, techniques, procedures, and the dedication to craft that is required to produce these amazing illustrations. He covers the step-by-step procedures while producing fresh artwork for this book featuring a McLaren Can-Am car as well as a vintage Harley-Davidson. Although the procedures covered here are unique to Kimble, and pretty much a pipe dream to mere mortals, this title provides an inside look into how he does it. Also included are the stories and tales of how it all started, traveling the world to illustrate cars, behind the scenes with manufacturers, the Corvette years, as well as a gallery of many illustrations. Never before has David Kimble provided a look into his cutaway "skunkworks," or shared the procedures for bringing these beautiful technical illustrations to life. This book is a must-have for any automotive or art fan.